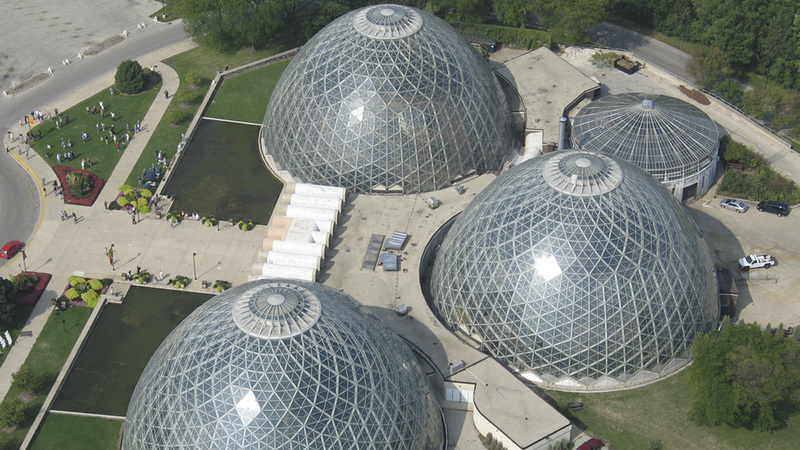 Completed in 1967, the conservatory is located in southern Milwaukee’s 61-acre Mitchell Park, established in 1890 when the Milwaukee Park Commission purchased some 25 acres of land from the Mitchell family. The original conservatory, designed by Henry Koch, was constructed in 1898, along with greenhouses for plant propagation, which provided plants for the conservatory and other parks and boulevards. In 1904, the Sunken Garden was constructed, featuring extensive parterre gardens, fountains, and a large water mirror. The park was transferred from the City of Milwaukee to Milwaukee County in 1937, and the old conservatory was razed in 1955, having suffered from neglect. Local architect Donald Grieb then won a design competition in 1958 for a new conservatory with his innovative plans for three dome-like structures, each 140 feet in diameter and built with a cast-concrete undercarriage covered by a steel-and-glass shell. Construction began in 1959. 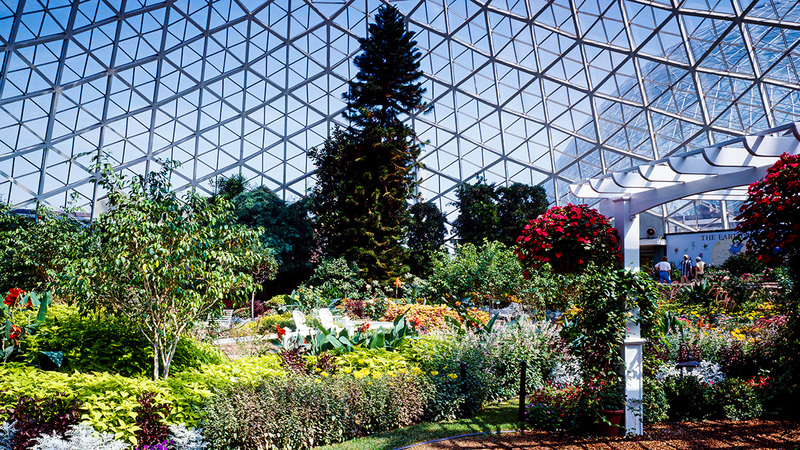 The Floral Show Dome, which hosts seasonal shows and an annual holiday exhibit, opened in 1964. The Tropical Dome opened in 1966, eventually featuring birds and nearly 1,000 species of plants. The Arid Dome, opened in 1967, is home to a wide variety of plants from Africa and the Americas. 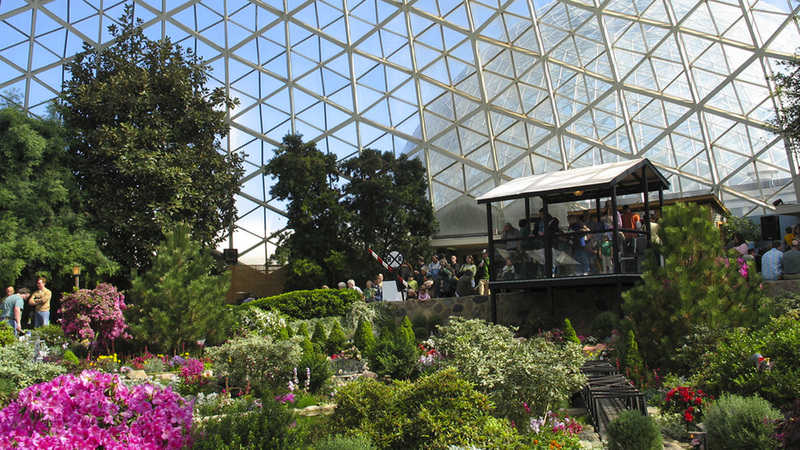 A central lobby connects the three domes, and a smaller service dome behind the conservatory contains replacement plants and an orchid collection. 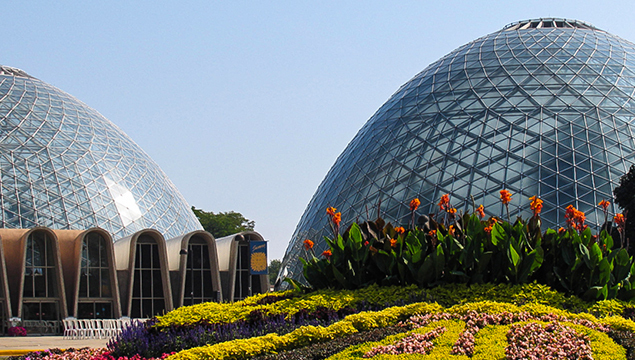 Greenhouses separate the domes from the conservatory’s eastern lawn. The beds around the conservatory feature grasses, perennials, shrubs, and small trees, while walking paths meander around a pond to the southeast of the Domes. Budget constraints led to the removal of the Sunken Garden in 1994. 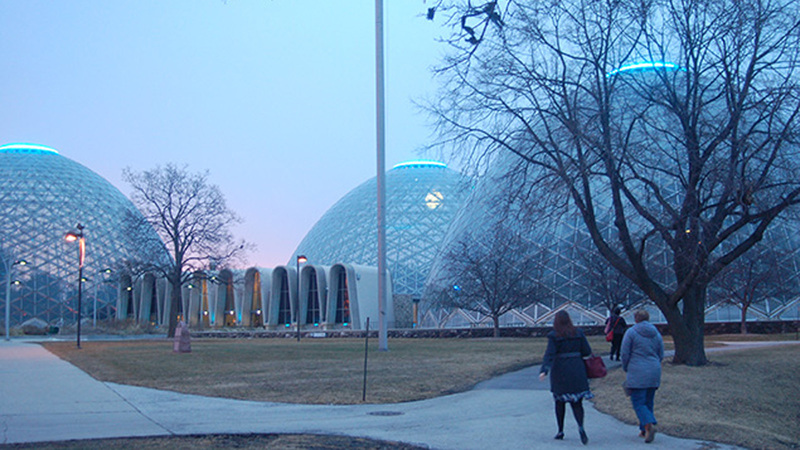 In 2008, internal and external lighting systems were installed in the Domes, the central lobby was remodeled, and glass panels were replaced.